Using the proper tools in your garden can make your life easier, save you time and keep you out of the doctor’s office, said Nellie Gardner, horticulturist at Frank Lloyd Wright’s Martin House Complex. Gardner, along with her assistant, Norma Wiegley, will lead a workshop called “The Sharpest Tool in the Shed” from 6:30 to 8 p.m. Tuesday, March 20 in the Greatbatch Pavilion at the Darwin Martin House, 125 Jewett Parkway, Buffalo, NY 14214. Gardner will showcase all her favorite tools that she uses on the landscape at the Darwin Martin House, and explain what you should look for when purchasing tools. She will also demonstrate tool sharpening, so bring your clippers or scissors. The cost of the workshop is $15 for members and $20 for non-members. Reserve you space now or call 716-856-3858. Here are four quick tips from Gardner that you can keep in mind as you choose new gardening tools. 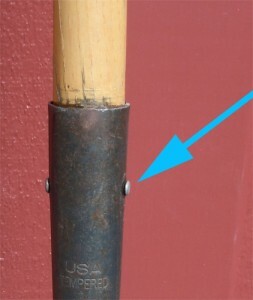 Look for gardening tools with replaceable handles. You should purchase high-quality gardening tools, not disposable tools, she said. Fiberglass handles tend to bend and break, Gardner said. Instead, choose tools with wooden handles. You also want to purchase a tool whose wooden handle can be replaced if it does break. 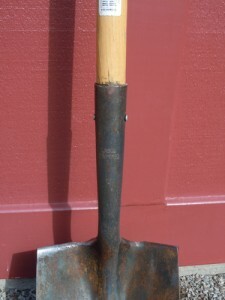 Look at the metal shaft or collar that protrudes from the shovel blade or rake head. That’s the part that the handle fits into. If that shaft or collar is nice and long, as it is the photo at the beginning of this article, you will be able to replace the handle. She also explained that the handle is separate from the shaft, so there needs to be a bolt to secure the handle to the blade, as you can see in the photo at right. Garden shovels should be sharp. When digging in the garden, the sharper your shovel is, the better, Gardner said. The blade should be pointed. See how much of the blade contacts the soil, Gardner said. You want as little of the blade contacting the soil as possible. Learn what tools are available. You may not even be aware of tools that can make your life easier. For example, have you ever heard of a Japanese pruning saw? If you take a look at the photo at right, you can see that its teeth are totally different from the teeth on an ordinary pruning saw, and they’re very sharp. An ordinary pruning saw contains cutting teeth, which, as you can tell by the name, do the cutting. An ordinary saw also contains raking teeth, which removes saw dust from the groove as you’re cutting, she explained. The Japanese pruning saw contains nothing but cutting teeth. Because those teeth are designed to do double duty and rake out the saw dust, too, there’s no need for extra teeth that don’t cut. Choose garden tools that are the right size for you. 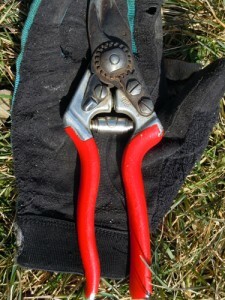 Most garden tools such as rakes are designed for men and larger people, Gardner said, and many women find them difficult to use because the tools are too big. Using tools that don’t fit your body can cause strain to your neck, shoulders, back or wrists. She suggests that women look for tools that are half size or three-quarters size. The clippers at right are professional tools, but see how small they are compared to the gloves. When you use tools that are the right size for your body, you won’t get as tired and you won’t get conditions such as tendonitis when you do repetitive motions, such as when you’re raking, she said. Good tips, Connie. Sharp tools and tools that are the right size for the user are often overlooked. They’re simple points, but they sure do make a difference! 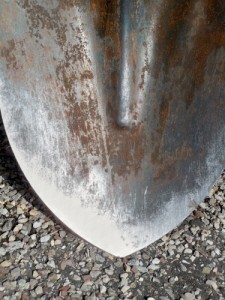 How are tools like the garden spade in your article, sharpened? I sharpened the shovel on an electric grinder, however we always sharpened our tools on a foot pedalled grinding wheel as a child. A file also works but more work!